As an organization, we take our role as the stewards of Bryant Park quite seriously. Since the restoration of the park twenty years ago, we have continued to upgrade Manhattan's town square. We are dedicated to innovation and enhancing the most detailed aspects around us. The New York Daily News recently covered Bryant Park Corporation and our sister business improvement district, the 34th Street Partnership. The article gives you a peak inside our management strategies that aim to keep Bryant Park at the top. When flying over New York City in the dark of night, look down. Two areas shine with white light. All others are dull yellow. From the ground, if you look closely, the buildings in these areas seem brighter. People’s faces are lit better. 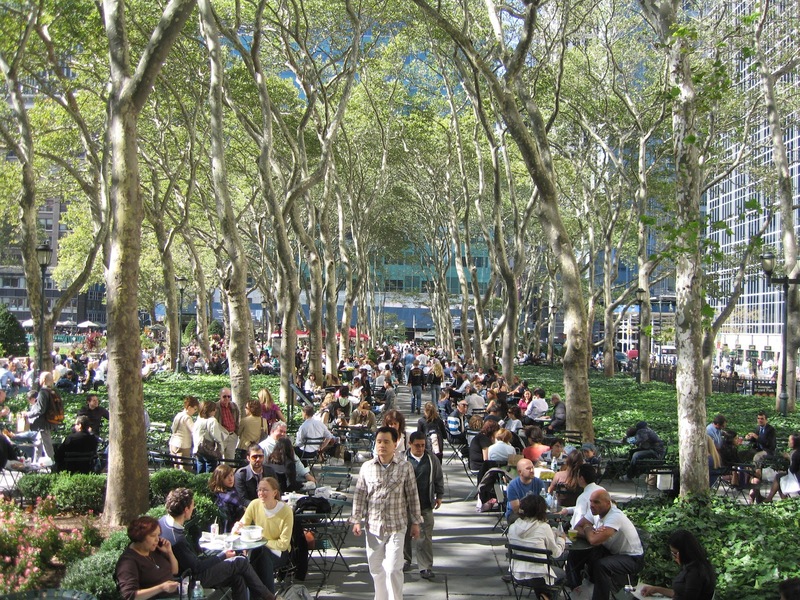 Just blocks apart in midtown Manhattan, the areas share something: Both Bryant Park and the 34th St. retail corridor are managed by groups led by Dan Biederman, a pioneer in neighborhood improvement and the first person to use private funds to better public spaces. Biederman runs the Bryant Park Corporation, 34th St. Partnership, and Chelsea Improvement Company. His Biederman Redevelopment Ventures helps cities worldwide. Behind the scenes, perhaps no other person has done more for city neighborhoods. One of his biggest mantras — it’s in the little things. Biederman is probably the world’s foremost expert on “pedestrian experience” and physically improving a neighborhood. He’s been studying it since the day he took over at Bryant Park. Back then, it was a drug den and bathroom for the homeless. Brooke Astor was offered marijuana on the library steps. Graffiti covered most of the stone. No fountains worked. The great lawn was a dirt patch. Today, it’s midtown’s social center, enjoyed by more than 6 million people per year who come to lunch, sit after work, watch their children ride a carousel or enjoy an event. It’s become one of the top parks of its size (9 acres if you include the library building) in the world. With an annual operating budget of $7 million, around 15% (or 10 cents per square foot) comes from assessments on local business and building ­owners. The other 85% comes from sponsorships, events and concession rents. CitiPond brought in $2 million for the 2011-12 season, most of which goes to rink and market operators. Rents paid by kiosks and restaurants such as Bryant Park Grill bring revenue. So do programs such as the HBO-sponsored film festival. On 34th St., where events and sponsorship are more difficult, the budget is $9.9 million and landlords pay 29 cents per square foot. Biederman is highly competitive. He lives to innovate, for his organization’s ideas to be copied around the world. He thinks the city is doing a terrible job policing illegal food vendors. Whenever he walks the streets anywhere in the world, he looks to see if they’re doing a better job than he is. If they are, he searches for the individual in charge. When he walks in Bryant Park, he smiles and smirks, and picks up trash. His groups do meticulous studies. One showed that more than 10,000 people per hour walk 34th St., where usage has doubled in 10 years. Of the 600-plus stores on the corridor, they have identified 70 needing improvement. That’s down from 400 in the early 1990s. Biederman’s innovations include sleek tree pits, benches designed by a strong in-house design team and an award-winning horticulture and street plaza program that has brought life to Greeley Square and the triangle outside the Apple Store on W. 14th St. Under Biederman, Bryant Park was one of the first parks in the world to use kiddy-size tables and chairs. That idea was copied worldwide. Biederman’s team counts 60-plus people, including an archivist who studies park and area history. The company is broken into a retail component, events and programming team, capital improvement construction group, design department, business affairs, operations, sanitation and security. They come together in a weekly “Streetscape” meeting that is the most educational and informative urban teaching symposium we’ve ever seen. Slide shows, presentations and open discussions dominate the two-hour Biederman-led sessions. Opinions are mandatory. Cell phones are forbidden. They discuss bathroom air dispensers, illegal vendors creating odors, streetlight design, go over all area press, read tourist reviews, and schedule potential events. Biederman is more matter-of-fact than arrogant. His proof is in the pudding. The park and 34th St. look better than nearby areas. Commercial and retail rents are up significantly more in the districts he manages than surrounding areas. Bryant Park has seen the construction and leasing of the Bank of America tower, with another class-A office building on the way. Around 34th St., upscale brands have increased. While some critics argue that Business Improvement Districts and Biederman’s groups increase the pace of gentrification, others criticize the sterility of Biederman-managed areas, calling them too clean. So what areas would Biederman like to get his hands on next?